Washington, March 22 (CNA) An official from the U.S. State Department said Friday that China was "busy" changing the status quo across the Taiwan Strait through moves including imposing military threats against Taiwan, poaching the island's allies and raising pressure to cut its international space. Patrick Murphy, the U.S. State Department's principal deputy assistant secretary for East Asian and Pacific affairs, said in an interview with Voice of America (VOA) that the primary desire for the United States was to see a strong commitment to maintaining the status quo. "China has been busy changing the status quo on this arrangement that has produced prosperity, stability, and peace, even with some of the unusual aspects," Murphy said when he was in Hawaii during a trip to the U.S. state, Thailand and Indonesia. "What I mean by changing the status quo is we have heard voices in Beijing threaten the use of violence directed at Taiwan; we have seen China aggressively try to reduce the number of diplomatic partners that Taiwan enjoys around the world," the official told VOA. To intimidate Taiwan, China has also stepped up military threats through various aggressive and provocative actions, such as the dispatching of warships, bombers, and fighter jets to encircle the island and conducting live-fire military exercises near Taiwan's waters. In addition, in a speech made in January, Chinese President Xi Jinping (習近平) said China makes no promise to give up the use of force, and reserves the option of taking all necessary means against Taiwan independence separatists. Under the previous Taiwanese administration of Ma Ying-jeou (馬英九), from the China-friendly Kuomintang (KMT) party, Beijing largely refrained from poaching Taiwan's allies or carrying out military maneuvers near its waters. The two sides were widely seen as enjoying unprecedented good relations from 2008-2016 during Ma's terms in office. However, Beijing sees President Tsai Ing-wen (蔡英文), from the pro-independence ruling Democratic Progressive Party, as changing the status quo. Since she took office in May 2016, she has refused to continue the previous administration's policy of acknowledging the '1992 Consensus,' a tacit agreement reached between the two sides that there is only one China, with the KMT defining it as each side having the freedom to define what that China is, be it the People's Republic of China (PRC mainland China) or Republic of China (Taiwan). Accepting that agreement allowed the two sides to cooperate and reduce hostilities. Tsai however has insisted the agreement means only what Beijing wants it to mean, that the PRC is the only legitimate China, with Taiwan as a part of it. As a result of Tsai's government refusing to accept the agreement, Beijing has stepped up pressure on Taiwan, to warn it against moving toward independence. 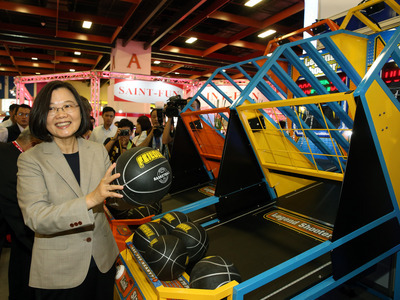 Under Tsai, Taiwan has lost five diplomatic allies -- Sao Tome and Principe, Panama, the Dominican Republic, Burkina Faso and El Salvador -- believed to be lured away by financial incentives from China. China's pressure to shrink Taiwan's international space has left the island with only 17 diplomatic allies. "China has been busy trying to crop Taiwan out of the international space and international organizations where Taiwan has made important contributions to public health, civil aviation and many more global concerns that affect all around the world," Murphy said in the interview. As for the U.S. desire to see the status quo across the Taiwan Strait be maintained, Murphy said such a commitment has "brought about peace, stability, and prosperity for all concerned." Analysts, however, say Beijing has also been alarmed by the changes in the status quo since Tsai took office, including efforts by Washington and Taipei to establish closer and regular contact and the U.S. adoption of the Taiwan Travel Act, which encourages visits between Taiwanese and American high level officials. Murphy said the U.S. continues to recognize the "one China policy", which has been firmly based on the important historical documents such as the Three Joint Communiques negotiated with China in 1972, 1978, and 1982 and the Taiwan Relations Act (TRA). The TRA was enacted in 1979 after Washington severed ties with Taipei, with the aim of defining future unofficial relations between the U.S. and Taiwan. "This framework has served us, Taiwan and China well for the past 40 years now," Murphy told VOA. Commenting on Washington's arms sales to Taipei, Murphy said under the framework, there is a precedent. "And it's a matter of policy in the United States that Taiwan's defensive needs are merited. So the United States has been a helpful partner in that regard," he said.